Early today, Eurodiaconia published a one-page overview explaining the key steps of the European Semester and how to get involved. This involvement is important because the European Semester is a key policy tool of the European Commission to encourage member states to do reforms. Throughout the last couple of years, the Semester has become more social, as well as the framework for monitoring the implementation of the European Pillar of Social Rights. This year, it should also assess the investment needs of member states in order to inform the allocation of funds from the new Multiannual Financial Framework. The first stage of the 2019 cycle took place on 21 November 2018 with the publication of the Autumn Package. It determined the EU-wide priorities for the cycle, and confirmed the will to further rebalance the process by stressing the importance of social inclusion and of reducing inequalities. Eurodiaconia responded to the key documents that were the Annual Growth Survey, the draft Joint Employment Report, and the draft Euro Area Recommendations. The second stage of the European Semester – namely the Winter Package and the publication of the 28 country reports – is fast approaching. It is planned for 27 February. This stage will highlight the main strengths and challenges of each member state, and will inform the drafting of national reform programmes and country-specific recommendations. To respond to this stage, Eurodiaconia will do a survey among its membership in order to get members’ opinion on the quality of the assessment in their country report. 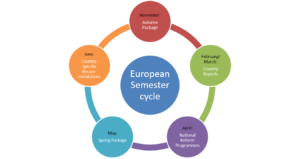 To know more about the 2019 European Semester and how to get involved, please check our Timeline of the 2019 European Semester. For more information on the European Semester and Eurodiaconia’s related work, please contact our Policy Officer Laure Drege at laure.drege@eurodiaconia.org or our Policy Assistant Lukas Humer at lukas.humer@eurodiaconia.org. To know more about the European Pillar of Social Rights and Eurodiaconia’s work on this subject, please check our latest publication. Eurodiaconia’s response to the 2019 Euro area recommendations.